Town & Fort Of Jadpoor [Jodhpur], From The S.E. bl.uk > Online Gallery Home	> Online exhibitions	> Asia, Pacific and Africa Collections	> Town & Fort Of Jadpoor [Jodhpur], From The S.E. 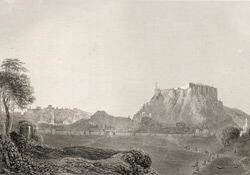 Engraving of the town of Jodhpur by Edward Francis Finden (1791-1857) and Patrick Young Waugh (1788-1829). Plate 16 of James Tod's 'Annals and antiquities of Rajast'han or the Central and Western Rajpoot States of India' published in London in 1829. The city of Jodhpur has been the capital of Marwar in western India from the 15th century. It was founded in 1459 on the edge of the arid Thar Desert by Rao Jodha (r.1458-89) of the Rathor Rajputs, replacing the previous Marwar capital of Mandor. Jodhpur lies on the Delhi-Gujarat trading route, on a plain surrounding an isolated rock on which stands the formidable Meherangarh Fort. Within the fort at the northern end are the Old Palaces, a series of beautiful courtyard buildings, which date from the 17th century onwards. The fortified area stands to the south with a long wide terrace to the east.